Whether you're a professional recording engineer or a consummate tone purist, if you want to get the best possible sound from your tube amp, then you need an AmpRX BrownBox voltage attenuator. All tube amps (especially vintage tube amps) are designed to run at an optimal voltage, and standard 120V/AC wall current is typically too high for vintage tube amps, as well as some modern designs. With its proprietary 5-amp transformer and flexible attenuation options, the AmpRX BrownBox lets you bring that current down to an optimal level, resulting in significantly improved amp performance. Another benefit of running your amp at optimal voltage is that your tubes will usually last much longer — something many of us who've paid a pretty penny for new-old-stock tubes can appreciate. The BrownBox is far safer and more effective than any standard variac, because it limits the input voltage and attenuates the output voltage. 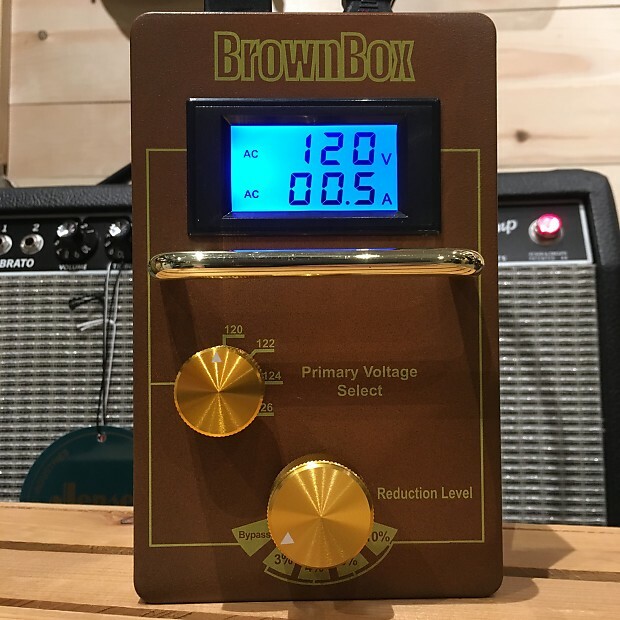 Figuring out your amp's optimal voltage is as easy as Googling the specs, and the BrownBox's onboard output voltmeter lets you see exactly what you're pulling. The BrownBox's four voltage-reduction modes let you get as close to optimal as possible, and there's a bypass setting so you can A/B the results. Dramatically improves your amp's performance by providing optimized voltage. Optimal input voltage also extends the life of your high-performance power tubes. LCD voltmeter makes it easy to dial in the optimal setting for your amp. 5-amp, 120/122/124/125VAC input settings accommodate most wall currents. Equal or attenuated output ensures that you can't accidentally overload your amp. Choose from 4 attenuation modes (3%, 4%, 6%, and 10%) to fine-tune your voltage. Bypass mode lets you easily A/B the results of your optimized amp voltage. Braced metal chassis and protective bar withstand the most brutal touring conditions. Blue Mountain Music is the exclusive Canadian Dealer and Distributor of AmpRx BrownBox.